The wreck of the "Dinnington"
One of the bravest rescues ever undertaken was of the "S.S.Dinnington". 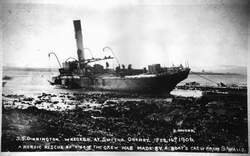 In 1906 the steamship "Dinnington" ran aground on the island of Switha at the south entrance to scapa flow . Nine men from the crew managed to make it safely to the island of Switha . 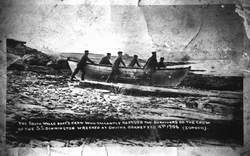 They were rescued by a group of local fishermen lead by William Taylor. 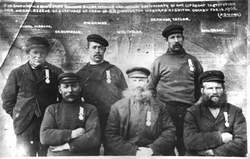 For their act of bravery in an open fishing boat in gale force winds and driving snow, they were awarded the RNLI's silver medal.